When I travel somewhere new, the first thing I do is check out a supermarket. I love roaming the aisles to discover new ingredients, snacks, and food traditions different than those in America. Like, did you know that you can get canned rhubarb and gooseberries in almost every supermarket over in England? Both are only available seasonally in the US, and both are rarely preserved in anything but jam form. In the Netherlands, sprinkles are sold in the breakfast aisle as hagelslag. Because over there, they eat sprinkles on buttered toast for breakfast! No wonder the Dutch are so happy. And while it's not quite as exciting to visit a supermarket in a different state, there are still enough local varieties that make it worthwhile. I recently accompanied Erlend to one of New York's famous Fairway Markets and was excited by their selection, filling up my basket with all the East Coast things that are such rarities out on the West Coast. Martin's Potato Buns, those jelly fruit slices that are reallyreallyreally good, and plastic tubs of rainbow nonpareil discs. I don't know why, but it's really hard to find rainbow nonpareil discs out west. You can get the black and white ones without a problem, but rainbow? Not so much. I really have no idea why, but I'm just happy to have found these. 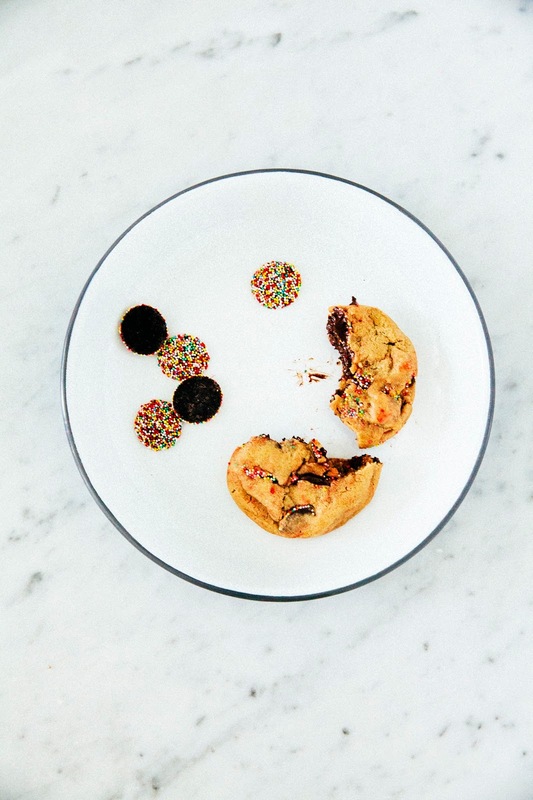 In a rare stroke of genius, I decided to swap them out with the chocolate feves I like to use in my chocolate chip cookies, resulting in these pretty, jewel-studded chocolate chip cookies. 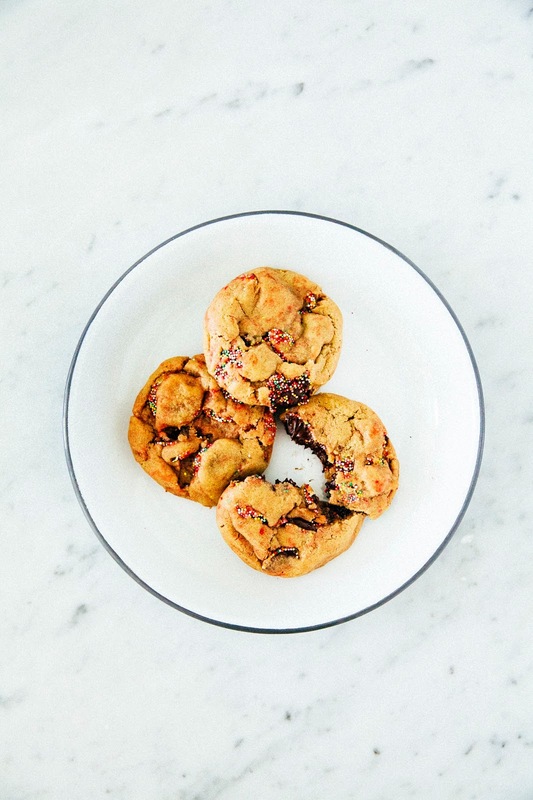 They're basically your beloved chocolate chip cookie, but SPRINKLED. 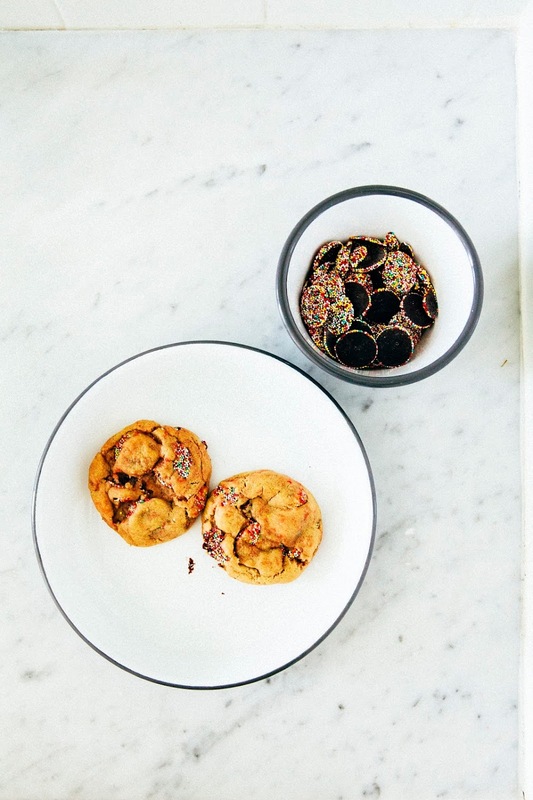 The nonpareils add a wonderfully textured and unique crunch. And a quick announcement before I leave you with the recipe: be sure to follow me on Instagram and Instagram stories the next few days! 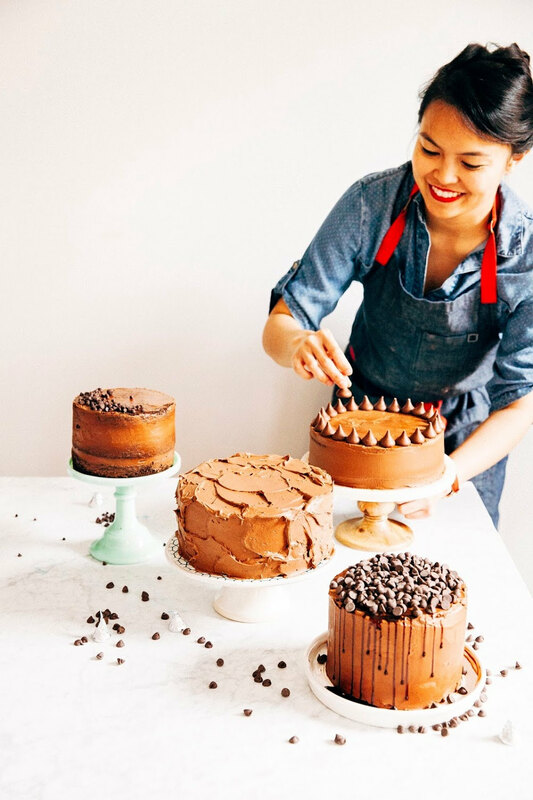 I'll be traveling to Pennsylvania to eat all the Kisses and kickoff a baking partnership with Hershey's, before hopping on a plane across the Atlantic to attend the Copenhagen Cooking & Food Festival with my dear friends Adrianna and Yossy. Get ready for all the chocolate and smørrebrød! Thank you to Falcon Enamelware for sponsoring this post by providing the pretty plates, bowls, and tray that you see in these photos! I've always thought their products were the prettiest, and I can't wait to have their plates and tumblers displayed on my soon-to-be-set-up kitchen shelves. As always, all thoughts and opinions are my own, and thank you for supporting Hummingbird High and my sponsors! 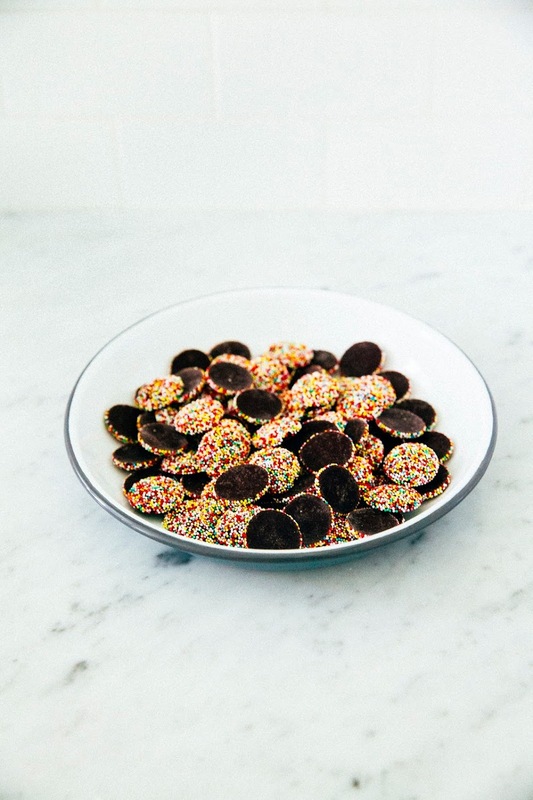 You don't need to go to the East Coast to buy rainbow chocolate nonpareils; you can get them online! If all else fails, you can also use the more widely available black-and-white version (which they also sell at movie theatres as Sno-Caps, lol) — your cookies just won't be as colorful. I've portioned out the dough so that my batch made around ten HUGE cookies; each dough ball pre-baked weighed 3 ounces (yes, I actually weighed each ball because I'm crazy). You can divide that in half for 24 smaller cookies. Also, the recipe also doubles wonderfully! Center a rack in the oven and preheat to 350 (F). Prepare a sheet pan by lining with parchment paper; set aside. In a medium bowl, combine 1 2/3 cups all-purpose flour, 1/2 teaspoon baking powder, 1/2 teaspoon baking soda, and 1 teaspoon kosher salt. Set aside. In the bowl of a freestanding electric mixer fitted with a paddle attachment, combine 1/2 cup unsalted butter, 3/4 cup dark brown sugar, and 1/4 cup granulated sugar. Beat on medium-high speed for 5 minutes, until the mixture is light, fluffy, and has doubled in volume. Once the mixture is light and fluffy, reduce the mixer to its slowest speed. Add 1 large egg and 1 teaspoon pure vanilla extract, mixing until both have just incorporated into the butter and sugar. With the mixer still on its slowest setting, add the dry ingredients (from the 2nd step) in three big portions, only beating until the flour has just incorporated in to the mixture. 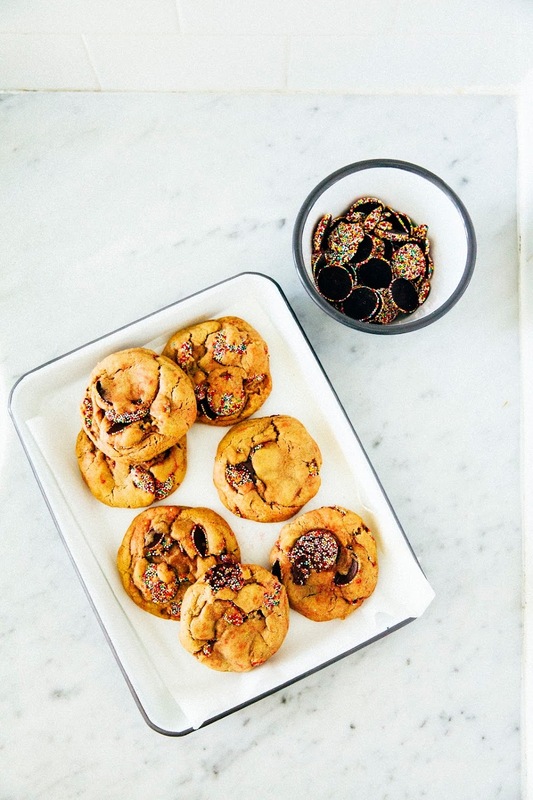 Add 6 ounces rainbow chocolate nonpareil discs and 4 ounces roughly chopped dark chocolate, beating on the mixer's lowest speed just until the chocolate has incorporated throughout the dough. 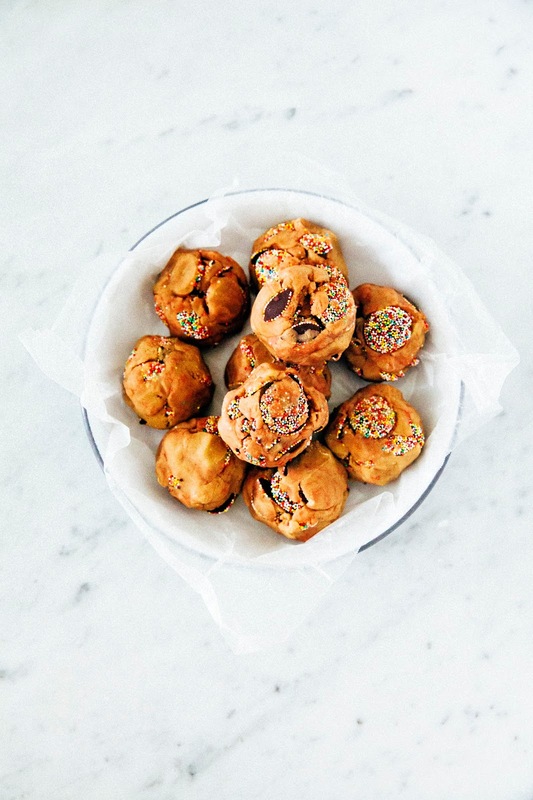 Use a 1-tablespoon sized cookie dough scoop to portion out 3 ounce dough balls. 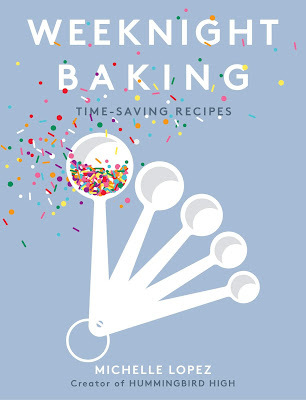 Use your hands to roll them into a rough ball, straightening and flattening any nonpareil discs accordingly (this will make prettier cookies, I promise). Press the top of each ball to flatten it and create a sort of squat disc. Arrange on the parchment lined sheet pan, leaving at least 3 inches between each dough ball. Transfer to the preheated oven and bake for 18-20 minutes, or until the edges are set and the tops are brown, but the center is still a little bit doughy. Be careful not to overbake the cookies, or they'll be rough and crunchy and I'll cry! Unless you like a crunchy cookie. In which case, I won't. 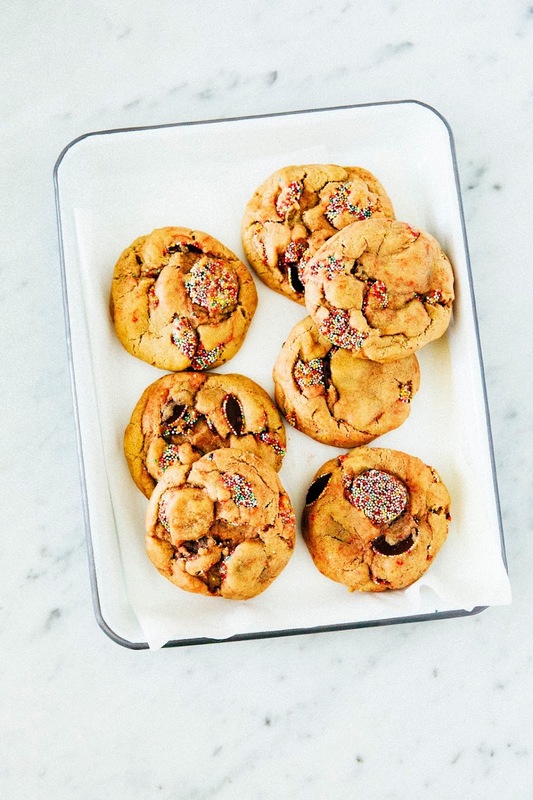 Once the cookies are done, transfer to a wire rack and allow to cool on the sheet pan for 20-25 minutes, before using a spatula to lift them out the pan and transferring them to the wire rack to cool until warm enough to eat. Enjoy!